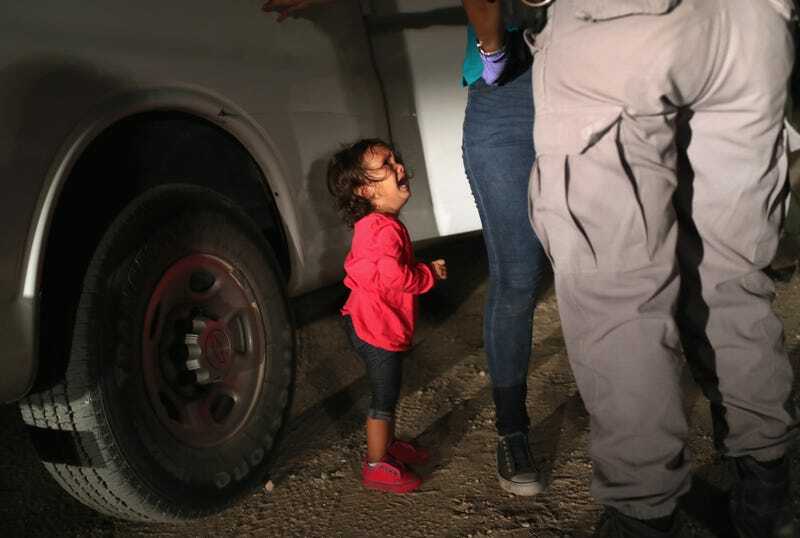 A 2-year-old Honduran child cries as her mother, seeking asylum for them, is searched and detained by U.S. Border Patrol agents near the U.S.-Mexico border on June 12, 2018, in McAllen, Texas. Amid a deluge of recent reports on the terrors that migrants are facing at the U.S. border, including stories of families being ripped apart and planned “tent cities” for unaccompanied children, public pressure is mounting against the Trump administration to change course on its draconian and cruel immigration policy. A number of professional organizations have written letters to the administration urging authorities to discontinue the “zero tolerance” policy, which uses forcible separation of children from their parents as a punitive measure to discourage families from migrating to the United States. Many of these families, particularly those from Central America, are fleeing violence and poverty in their own countries and are seeking asylum in the U.S. The zero tolerance policy was implemented earlier this year by Homeland Security Secretary Kirstjen Nielsen and Attorney General Jeff Sessions, who recently defended the decision by citing the Bible. Among those speaking out is Dana Sinopoli, a clinical psychologist who was so outraged about the government’s reported treatment of migrant children, she penned an open letter. As her letter circulated around the country, more mental health professionals jumped on board. To date, 90 organizational groups, including the American Psychoanalytic Association and the Coalition for an Ethical Psychology, have co-signed the letter, as have more than 4,500 mental health professionals. Sinopoli, who practices in Philadelphia, said she wrote the letter because she found that media coverage of the forced separations didn’t effectively center children’s experiences. Sinopoli says she’s heard people say that the separations won’t last long, that the policy will eventually come to an end. While she hopes that’s true, she stresses that the cognitive, behavioral and, in some cases, physical damage to the child has already been done. “I had one colleague who I think put it really well, that for some children this will be experienced as a hangnail—something that is an irritant that shows up in more kind-of-minor ways. For other children, this will be the equivalent of having their arm chopped off,” she said. Sinopoli, who has conducted workshops for police and attorneys on the effects of trauma on the brain, says that these kinds of separations have been linked to post-traumatic responses, anxiety and depressive struggles that follow children well into adulthood. She also points out that by the time a U.S. official tears a child away from his or her parent, the child has likely been exposed to multiple traumas. Not only is there the difficult and sometimes deadly journey to the U.S. border, but there are also the unsafe conditions in the family’s home country that caused the parents to flee in the first place. Little in the Trump administration’s official responses indicates that anyone much cares about the damage they’re inflicting while dealing with a problem of their own making. In the last several weeks, there have been disturbing reports not only about migrant children being forcibly separated from their guardians (as one Boston Globe reporter noted, the parents are lied to in order to keep them from protecting and holding on to their kids), but also about the conditions in migrant youth shelters. One Los Angeles Times article published Thursday reports that these shelters are understaffed and unequipped to handle the thousands of unaccompanied children who will be filling them. One former shelter worker told the Times that the staff was ill-equipped to handle the trauma the kids were facing. “Officials had told [three crying children] their parents were ‘lost,’ which they interpreted to mean dead,” the Times reports. This week, Department of Health and Human Services officials confirmed their plans to build “tent cities” in Texas that would house thousands of children. The first will be in Tornillo, Texas, which will hold 450 beds for the children, according to NBC News. It’s unclear how soon the tents will be set up, but it’s worth noting that the temperature in Tornillo is currently well into the 90s. Sinopoli points out—as have many others—that we’ve seen this treatment of children before. “We know that slaves were separated from their children before they were sold into slavery. This was really a process of dehumanizing, that they were being punished by having their children taken away from them,” she said, adding that this also happened with the forced assimilation of Native Americans as well as to Jewish families hauled off by the Nazis to concentration and extermination camps during the Holocaust. While the letter is clearly targeted at Donald Trump’s administration, Sinopoli feels that the treatment of vulnerable migrant kids shouldn’t be a partisan issue. “These children are paying the price for this policy, and this policy is being put out there at the expense of these children,” she said. “It’s either that it’s being forgotten that they’re children, or the alternative is even scarier. That [they’re] being dehumanized. That these children are not being recognized as human, which is exactly what happened during slavery and with Native Americans and with the Jewish people,” Sinopoli said. The petition is currently set so that every time someone signs their name to it, Secretary Nielsen receives a copy in her inbox. Sinopoli hopes to collect 10,000 signatures, at which point physical copies of the letter will be sent to Nielsen, Sessions, the White House, and House and Senate leadership. Sinopoli adds that speaking up isn’t just a personal imperative; it’s also a professional one, noting that a number of other professional organizations, like Physicians for Human Rights and the American Civil Liberties Union, have called for a reversal of the policy of forced familial separation. “Silence can be violence in its own way, or at least [be] complicit and tacit agreement,” she said.